Ponders Hollow offers engineered wood flooring, custom made for you in any of the domestic and imported wood species we mill. Unlike solid wood flooring, which typically is not used below grade, engineered wood flooring can be used below grade, at grade and above grade, and is suitable for use with radiant heat. 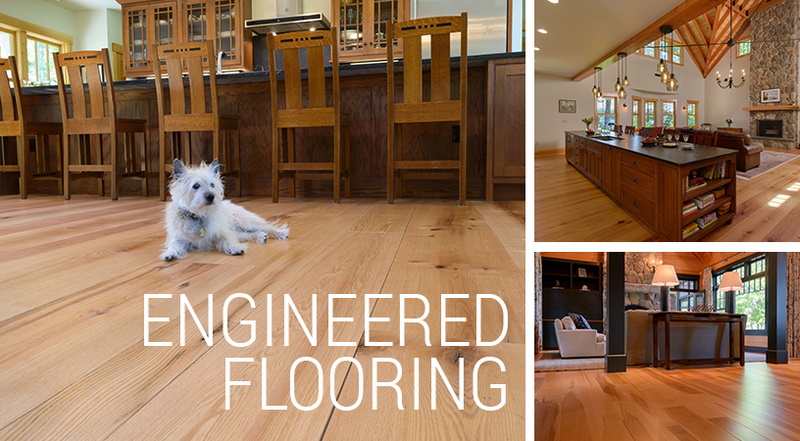 Engineered flooring is comprised of three components. 1. Substrate [or base] is plywood. Ponders Hollow uses Baltic Birch, the industry gold standard. The substrate is comprised of multiple cross lock—or interlocking—layers, glued together with each layer running perpendicular to the previous layer. With this type of construction, each layer helps prevent movement from the others. This is a primary reason engineered wood flooring is so stable. 2. The “Wear Layer” is the species of wood that is on the top of the Baltic Birch. This is sometimes referred to as a lamella or veneer layer. The thickness of the Wear Layer, which typically is given in metric, determines the number of refinishes you can do over time. 3. The glue used may be the most important component in engineered wood flooring. There are two methods of gluing lamellas to the Baltic Birch substrate: cold gluing and hot melt PUR glue, which is the industry standard and what we use. Ecological impact: We use a VOC -compliant hot glue and FSC certified Baltic Birch, so the plywood meets the California Air Resource Board [“CARB”] for formaldehyde emission standards. Additional specifications are available from your salesperson.